We just launched pandas Foundations taught by Dhavide Aruliah, Director of Training at Continuum Analytics! In this course, you'll learn how to use the industry-standard pandas library to import, build, and manipulate DataFrames. With pandas, you'll always be able to convert your data into a form that permits you to analyze it easily. You'll also learn more about NumPy, how it stores data, and its relation to the pandas DataFrame. Ready to get started? 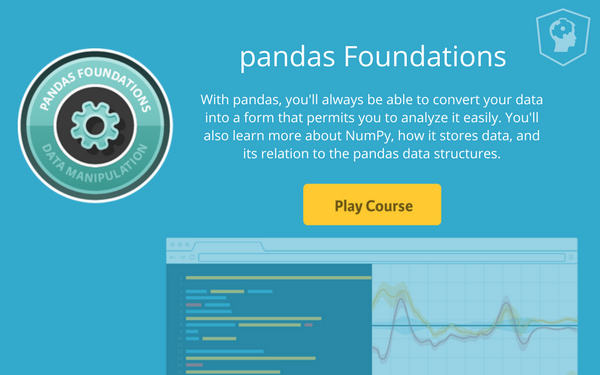 pandas Foundations features 63 interactive exercises that combine high-quality video, in-browser coding, and gamification for an engaging learning experience that will get you on your way to becoming pandas master! In the first chapter, you will become acquainted with the powertool of pandas - the DataFrame. You will learn how to use pandas to import and then inspect a variety of datasets, ranging from population data obtained from The World Bank to monthly stock data obtained via Yahoo! Finance. You will practice building DataFrames from scratch and become familiar with pandas' data visualization capabilities [Start First Chapter For Free] The next chapter focuses on Exploratory Data Analysis with pandas. Next, you will learn how to manipulate and visualize time series data using pandas. You will become familiar with concepts such as upsampling, downsampling, and interpolation. You will practice using pandas' method chaining to efficiently filter your data and perform time series analyses. Lastly, you will bring together and apply all of the skills you have acquired in this course with a case study.